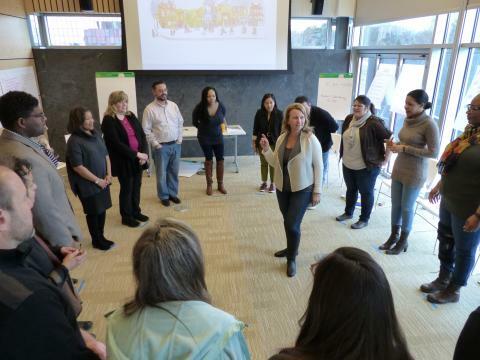 This month, Amy B. Robinson of The Kresge Foundation, shares with LOCUS her blog describing the Foundation's experience with impact investing in practice and the lessons learned along the way. This post originally appeared as a blog article on The Kresge Foundation's website. See the original version, here. A foundation doesn’t decide to begin using its dollars in new ways lightly. That includes the decision to try impact investing alongside a grant making strategy. Kresge made that transition about 10 years ago. It wasn’t always easy, but it was the right thing to do in terms of creating the most impact in communities around the U.S. There have been numerous lessons along the way, as we moved from doing our first, zero-interest program-related investments to human services organizations in 2008 to respond to the Great Recession… to today, when we’re deploying $350 million through a mix of loans, guarantees, mission-related investments and equity investments in partnership with all seven Kresge program and practice areas. Each innovation of our Social Investment Practice has had back office implications, from staffing to portfolio management, from monitoring to payments. Foundations are used to working in a set way to make grants, and that’s perfectly fine. But working in new ways requires new processes, partners, flexibility and reflection. Here are the four key takeaways I share with other CFOs when asked how Kresge manages operations when it comes to impact investing. I frequently hear from foundations that are wary to jump into impact investing because they don’t have all the internal processes figured out, and I understand. But I also know from our experience that there is an element to building it as you go. When we first started to make program-related investments, we had accounting staff who knew how to amortize a loan, for instance. But we weren’t a bank, and we didn’t have the software for it. Likewise, our general ledger didn’t have the functionality to invoice someone, because we rarely needed to do that before. So, we had to create an invoicing process and build out a new module for our general ledger system. In addition, our practice was to pay grants on the 15th or the 30th of the month and rarely outside of those dates. Well, loans don’t work that way; there are draws based on our borrowers’ needs, so those could be any day of the month. You must adjust your system— or at least try to adjust your system — to be able to move money when the borrower calls it or it's ready to be drawn. We also had to properly account for PRIs on our tax return, including modeling out impact on payout as disbursements are made, repayments are received, or calls are made on a guarantee. So, there were many learning moments. It probably sounds like an uphill climb, and sometimes it felt that way. But each one was a positive experience that ultimately made our team and work stronger. If you work collaboratively across departments — we work with social investments, program, investments, program operations and information management (grants management) and legal, just to name a few — to find processes that make sense for all stakeholders, solutions aren’t hard to find. Having the attitude of being willing to make things work through trial and error, learning and tweaking along the way, and having strong, open communication channels were all necessary for success. The lesson around consistency is to keep deal terms as simple as possible. Early on, we had a lot of varied terms and bespoke, custom transactions. We still do, to a degree. But we found simplifying covenants helps the borrower understand our terms early on and helps our internal team with monitoring and reporting. Because whatever bespoke terms you have, you’ll have to monitor against those. Communication between finance and program/social investments is key here, because sometimes the program/social investments teams will set up an agreement that can cause issues on the accounting end. Guarantees are a great example of this. Fair valuing guarantees is a complex area of accounting. It’s important to build in a premium for each guarantee at inception to help support our valuation approach. You must have that line of communication open, so you don't run into issues later. As our social investment practice got off the ground, we felt confident in what we were able to do to support it, even if some of our processes were manual. But as the portfolio grew to more than 50 investments, it became more of a strain on our finance team. With that many investments, it became difficult for the team to amortize, calculate monthly interest, do the invoicing, receive/disburse/reconcile cash for the transactions – it just got to be too much. But what we’ve learned in that last year is that there are options. There are consultants and firms to which you can outsource these operations, when you hit that threshold. We’re in the processes of moving many of our standard operations – monthly reporting, disbursements and repayments, sending invoices – to an outsourced firm. No matter the size of your foundation now, anyone newly contemplating impact investing should think carefully about staffing. If you’re not committed to adding a head or two, you will have to figure out creative ways to outsource that work. We’ve used consultants on due diligence, monitoring, legal and more. But we’ve also grown our team. We have a Portfolio Manager, who sits on the Social Investment team but manages the portfolio and works directly with my team on a near daily basis. We hired an Assistant Controller to shore up the Finance staff in other areas and spend a portion of time on this work. We now have in-house legal, which serves a variety of purposes, including assisting on impact investing. And we’ve done staff education for program and finance teams, as well as for our board, to better understand what these tools are and how to deploy them. Internal education is important. Finally, thinking carefully about governance will be essential. Who approves a deal? What level of investment must go to your board for approval? Do you have a committee for approvals and does it include external members from your full board? What is the maximum duration of the investments, as the need for this type of capital tends to be very long term? How will refunds be managed – back into corpus or as additional capital for the social investments/programmatic work? These are questions we grappled with early on and that we revisit often. We just revised our process this year, in fact. Impact investments are great tools to ignite social change. They’re incredibly impactful, and they leverage a lot of money for good. And you can recycle the funds for future grants and investments. It’s not the only tool or the only way to work, but with the right back office support, I believe more foundations could find their way to impact investing and be very satisfied with the results. Amy B. Robinson is The Kresge Foundation's Vice President, CFO, and Chief Administrative Officer. She is also the president of the Foundation Financial Officers Group.